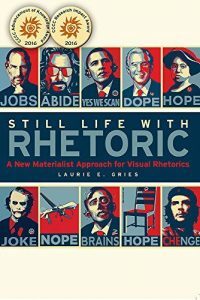 Gries, Laurie E. Still Life with Rhetoric: A New Materialist Approach for Visual Rhetorics. University Press of Colorado, 2015. Through the exploration of how images circulate and transform in a viral economy, Laurie Gries’s Still Life with Rhetoric adds an important new perspective to studies of rhetoric’s dynamic materiality. Drawing from a broad range of theoretical principles, the book weaves together strands of new materialism, actor-network theory, and rhetoric in the service of a revitalized approach to studying objects in motion. Using Shepard Fairey’s iconic Obama Hope image as a focus, Gries applies this interdisciplinary theoretical framework as she explores the image’s materiality, temporality, and consequentiality, articulating the significance of its circulation and transformation within collective life. Gries situates her research within the larger context of several emerging strands of rhetorical scholarship, including object-oriented studies and mobility studies. Proliferating in the humanities, sciences, social sciences, and arts, these research areas eschew communications models that triangulate sender, receiver, and text, as well as rhetorical models that study the elements of the rhetorical situation (audience, rhetor, text, and so on) as though such features remain fixed, unchanging. Instead, Still Life with Rhetoric contributes to a growing body of research that explores “how things (ideas, texts, images, people, capital, artifacts, etc.) move within and across and influence public culture” (xix). Dissatisfied with current rhetorical and communications models that fail to explain how Fairey’s image “went viral,” in her book Gries generates a new rhetorical methodology that she anticipates will better account for “the logics, structures, practices, collectives, and platforms that enable images to circulate and transform widely” (3). In her introductory chapter, Gries sketches the theoretical principles that form the core of her methodological approach and invites a reconsideration of the manner in which texts and images have been positioned within rhetorical analysis. Grounding her approach in the tenets of new materialism, Gries outlines the benefits of recognizing futurity and circulation as essential modes of exploring the rhetoricity of a dynamic object. Encouraging scholars to think “intuitively and ecologically about rhetoric” (20), Gries offers the central inquiry of Still Life with Rhetoric – tracing a single image’s distributed rhetorical becomings – as a test for the approach advocated throughout the book. The next two sections of the book, comprising Chapters 2 through 5, delve into a thorough exploration of the theoretical principles outlined in Chapter 1. Part 1 examines in more detail the spatiotemporal and agential matters of a new materialist approach. Visual rhetoric, as a discipline, has traditionally positioned the image and the viewer in specific, usually fixed, relation to each other. What Gries attempts to do in her book is to shift this analytic configuration toward a consideration of the image as an event rather than an object (27) by encouraging more “intuitive thinking” about time, space, and meaning via an interdisciplinary raft of scholarship that, together, hints at the affordances of such an approach (26). To illustrate this assertion, Chapter 2 includes a brief vignette that explores the rhetorical transformations of da Vinci’s celebrated Mona Lisa. Based on this example, Gries delineates the qualities of virtual-actual images (defined as images capable of manifesting in infinite, undeterminable ways) and single-multiple images (images that are simultaneously multiple and yet still maintain a sense of wholeness) before concluding the chapter with a discussion of the function of consequentiality within a new materialist framework. Chapter 3 incorporates an emerging “ecological sensibility” into the discussion, one that Gries insists “maps nicely” onto a new materialist perspective (57). To demonstrate this assertion, Gries explores the contributions that thinking ecologically stands to offer rhetorical analysis, articulating the way in which assemblage theories, developments in vital materialism, theories of distributed cognition, agential realism, contagion theory, and actor-network theory all point to better understandings of an image’s rhetorical agency (58). Part 2 of Still Life with Rhetoric explores the practical applications of a new materialist rhetorical approach. It is in this section that the book begins to synthesize the large assemblage of theories referenced throughout Part 1, suggesting research strategies that aim to cultivate a new, interdisciplinary method for rhetorical study. In Chapter 4, Gries articulates six principles extracted from the previous assemblage of theories, principles that Gries argues are “indicative of the thought style particular to the new materialist rhetorical approach” outlined in the book (86). These six principles are: (1) principle of becoming, which Gries describes as an “opening up of events into an unknown future”; (2) principle of transformation, a “virtual-actual process of becoming in which rhetoric unfolds in unpredictable, divergent, and inconsistent ways”; (3) principle of consequentiality, where the “meaning of matter is constituted by the consequences that emerge with time and space via its relations with other entities”; (4) principle of vitality, a recognition that things have “lives of their own and exert material force as they move in and out of various assemblages and trigger diverse kinds of change”; (5) principle of agency, which Gries describes as “a distributed, dynamic dance enacted by diverse entities intra-acting within and across assemblages”; and (6) principle of virality, which recognizes that a thing’s tendency to spread quickly and widely is a “consequence of a thing’s design, production, distribution, circulation, transformation, collectivity, and consequentiality” (86-7). For Gries, these principles are significant to a new materialist rhetorical approach because they challenge scholars to study certain things “in an intransitive, diachronic sense—as vital actants” (87), while also suggesting a set of principle-driven research actions: following, tracing, embracing uncertainty, and describing (88). In describing these actions, Gries characterizes following as an attempt to keep track of how an image transforms in order to make visible the significant role it plays in collective life (89), while tracing examines an image’s “exterior relations” in order to discover the way in which that image circulates, materializes, interacts with other entities, and triggers change (94). Gries describes embracing uncertainty as a research strategy, a withholding of judgement and avoiding pre-determined analytical frameworks, while describing is defined as “a composing act (de-scribing)” wherein the data collected as a result of the first three strategies are assembled into a meaningful account of how an image travels, transforms and acquires power in co-constituting “networks of relations” (102). In Chapter 5, Gries offers a detailed discussion of iconographic tracking, a research method she promotes as particularly applicable to these networks now that new media technologies have both simplified and complicated the study of the rhetorical life of images (109). For Gries, iconographic tracking offers affordances that neither representational approaches nor ethnographic studies offer, namely the ability to account for an image’s dynamic circulation and transformation as well as the numerous rhetorical consequences of that action (109). Gries describes four phases, or stages, of an iconographic tracking method, in which large amounts of data are collected, assembled strategically, and then subjected to a focused analysis Gries describes as “a recursive process” geared toward discovering an image’s “remixes and unintended consequences” (113). This process culminates in the final phase, in which researchers “conduct a close study of specific collectives” by attending to seven interrelated material processes: composition, production, transformation, distribution, circulation, collectivity, and consequentiality (113). In defining these seven processes, Gries explicates what is perhaps the core of the contribution that Still Life with Rhetoric makes to the praxis of rhetorical studies. Gries argues that researchers will find it enlightening to map the many different “happenings, desires, peoples, technologies, collective actions, and so forth” involved in an “image’s rhetorical becomings” (113). In other words, by attending to the processes outlined in the chapter, scholars can more fully understand how an image like Obama Hope emerges as a viral entity and cultural icon, an understanding materialized by mapping the salient collaborations that contribute to its complex rhetorical life. What is more, Gries asserts that by attending to the overlap between these processes in addition to the individual results, it is possible to make visible an image’s shifts via recomposition, reproduction, redistribution, and reassemblage, processes that Gries claims serve to further “intensify the circulation, transformation, and consequentiality” of an image and its derivatives (113-14). In the third section of Still Life with Rhetoric, Gries applies the methodology constructed via Parts 1 and 2, and she performs a detailed case study of the Obama Hope image. The initial chapter of this section, Chapter 6, explores the origins of the Obama Hope image, including the photographers, artists, and influences that converged to produce it. This chapter describes the initial distribution tactics of the image’s creator and Obama’s 2008 presidential campaign, as well as explores the role of social networking and the significance of the rhetorical design of the image that made it highly transferable to other mediums (164). The image’s popular repurposing is discussed, followed by a brief exploration of the consequentiality of the specific “distribution tactics, collective actions, and metacultural activity [that] helped the Obama Hope image become a powerful rhetorical agent in the 2008 election” (130). The second chapter of the case study, Chapter 7, explores issues of copyright and fair use that arose around the Obama Hope image from the beginning. Gries details how accusations that the artist, Shepard Fairey, used another’s photograph of Obama without first obtaining rights to do so embroiled it in conversations about fair use and catapulted the image back into circulation. Other uses of the Obama Hope image follow this discussion, including its place in education; the chapter then concludes with an examination of the impact of some of the unintended consequences of a viral image. Chapter 8 examines a number of “divergent transformations” of Obama Hope, including the commodification of the image, the rise of “Obamamania” in Africa (i.e., an intense popularity of Obama images and merchandise) (210), and the image’s reproduction and redistribution as parody and internet “meme” (220). Gries argues that a study of these transformations is significant because it makes visible, in part, the source of the image’s virality and rapid rise to becoming iconic. Contributing further to this status, Gries traces Obama Hope through its appropriation into political art, cartoons, and internet memes, which have become a “vital force in the digital age” (221). The final chapter in the case study, Chapter 9 describes interactions between the Obama Hope image and art activism, environmental activism, the Occupy movement, and the Arab Spring movement. Appropriated by a wide range of protests and movements, the Obama Hope image and its derivatives enact a remarkable degree of power to aid social justice movements “in nuanced, unforetold ways” (276). Given the image’s remarkable staying power, Gries characterizes Obama Hope’s continual re-emergence in ongoing activism as a visible demonstration of how “remix has become a popular transnational political practice with Obama Hope being a reliable go-to image for catalyzing change” (278). The concluding chapter of Still Life with Rhetoric shifts the discussion toward considerations of futurity and the importance of becoming more inventive with our research methodologies. As participatory media platforms continue to promulgate, Gries offers a persuasive argument for better and more flexible analytic methods. In re-conceptualizing the possibilities of rhetorical analysis, Still Life with Rhetoric is at once a challenge to existing (pre-determined) frameworks as well as an invitation to think more critically, and more broadly, about images (among other things) as vibrant matter entangled in (and co-constituting) various actor networks, assemblages comprised of both human and nonhuman entities. In the ongoing quest to account for rhetoric’s “dynamic and distributed dimensions” (288), then, Still Life with Rhetoric contributes a robust new materialist methodology to the burgeoning scholarly reconsiderations of the material, temporal and consequential things of collective life. 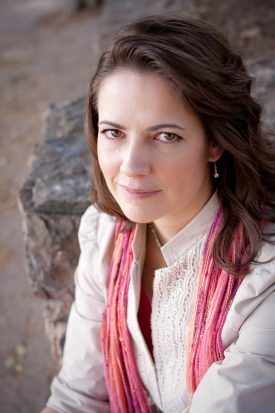 Shersta A. Chabot is a doctoral candidate in the English Writing, Rhetoric, and Literacies program at Arizona State University. Her research examines gendered public memory production at the intersections of digital and material culture. Her most recent research project explored key rhetorical relationships between the National Women's History (Cyber)Museum (NWHM) and the public, between object-based museum culture and the cybermuseum, between gender and physical versus digital space, and between materiality and digital exhibits. Her research argues for the re-centering of embodiment in rhetorical frameworks that seek to account for the complex rhetoricity and functional simultaneity of digital-material entities.